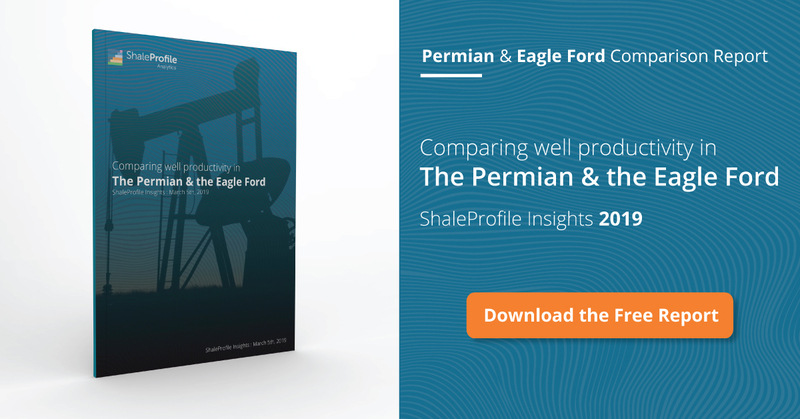 This interactive presentation contains the latest oil & gas production data from 11908 horizontal wells in the Permian (Texas & New Mexico) that started producing since 2009/2010, through June 2017. After the major upgrade of the lease allocation algorithm last month, this month I’ve made a number of smaller improvements to the Texas data. What hasn’t changed is that production is still reported incompletely for recent months. Therefore, despite the apparent stagnation of total oil production in the above graph, I expect to see that production is still climbing, after revision data is in. However, the growth rate in 2017 is probably smaller than in the preceding 3 years. Gas production from horizontal wells has also risen steadily over this period, and is now at about 4.5 Bcf/d, or 4 times the level just 4 years ago (switch “Product” to gas to see this). As noted in the Eagle Ford post this week, new horizontal well completions have been at a level of ~100 wells / month in the Eagle Ford in the past year. In the “Well status” overview, you’ll see that in the Permian this level has been quite a bit higher, at 150-200 wells / month. In combination with rising well production, this explains the growth in production in the Permian. The final tab (“Top operators”) shows that Pioneer Natural Resources has been the leading operator of horizontal wells in the Permian for almost 2 years now. Most of its production is located in just 7 counties, as shown in the map below the graph, if you click on its name in the legend. The strong increases in the well production profiles in recent years can also be seen in this “Ultimate Recovery” overview. Longer laterals, and the injection of far more sand during completions, has had a major effect on these curves. However, if you switch the “Show wells by” to “Quarter of first flow”, wells are grouped by the quarter in which production started, and then you’ll see that, since the 2nd quarter of last year, well productivity improvements have leveled off. Note that the wells that started in that quarter have produced more oil, on average, than wells from any other quarter, even those that started years earlier! They were after 13 months on production already at 138 kbo cumulative production (on average) . The “Well status map” shows the location and status of all these horizontal wells. Wells that are not yet completed, or already plugged, are now also shown in Texas. The Texas data has been updated on the Get the Data page. Also, I’m making a new payment option available as requested by some of you: now wire transfer is possible as well. Please contact me if you would like to use this new option. Next week Wednesday I will have a new post on North Dakota when August production is available, followed by a post on all 10 covered states in the US. Texas RRC. Oil production is estimated for individual wells, based on a number of sources, such as well completion reports, regular well tests, oil proration data, and well inactivity reports. EIA drilling report has wells completed at 1708 through June. If I read your charts right, you have the horizontal well count at 738 through June. Am I correct here? > If I read your charts right, you have the horizontal well count at 738 through June. Am I correct here? Correct. These are preliminary though. As you can see in the “Well status” tab, there is typically a steep drop in the last few reported months, which is caused by incomplete data. My guess is that the final tally will be closer to 1000. > EIA drilling report has wells completed at 1708 through June. I have in the past compared my methodology with that of the EIA. The EIA used to count all wells (including conventional) in a certain region, model incomplete data, and may use somewhat different geographical boundaries. Probably these factors explain the difference with my numbers. On the right hand side there is a Excel spreadsheet DUC data. That has information on wells.